Love on a Dime was written by Cara Lynn James. 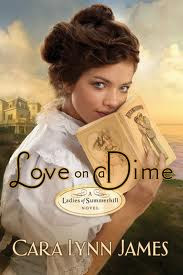 It is the first book in a series called Ladies of Summerhill. In an age of elegance and excess, Lilly Westbrook longs for a love both true and eternal. Newport, Rhode Island, 1899, is a place of shimmering waves, sleek yachts, and ladies of leisure. Of opulent mansions that serve as summer cottages for the rich and famous. Home of railroad magnates and banking tycoons--dashing young men and the women who aspire to marry them. No one in Lilly's social set knows she pens fiction under the nom de plume Fannie Cole. Not her family or the wealthy young man about to propose to her. And especially not Jackson Grail, the long-lost beau who just bought her publishing company...and who stirs her heart more than she cares to admit. But Lilly must put aside her feelings and follow the path that will maintain her family's social stature and provide the financial security that everyone is depending on. All of that said, I guess the long and short of it is that I did enjoy the story but I'm not rushing off to get the next of the Ladies in Summerhill Series. If I find myself lacking an idea of what book I want to read next I might take a look at the next book in the series though.